The DeLorean Motor Company is a brand without a car and the Pontiac Solstice is a car without a brand. That leaves the company wondering: if John DeLorean were still alive, would he try to save Pontiac? Or one Pontiac? As we all know, the folding of both Pontiac and Saturn has left the small RWD platform without a home. It also left GM's Wilmington, Delaware plant without a purpose. The new DeLorean Motor Company, which we toured last summer, is currently the main keeper of the DeLorean flame and up-keeper of the world's fleet of DeLoreans. They're also producing a small series of upgraded second generation cars. Could they also carry forward the spirit of a company enriched by John DeLorean's vigor and genius? "JZD always said that the best memories of his automotive career were at Pontiac, and that connection between JZD and Pontiac is probably one of the better known associations among car enthusiasts," said James Espey, Vice President of the DeLorean Motor Company. 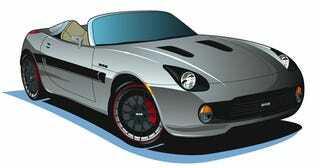 The company has released the above drawings and acquired a Pontiac Solstice GXP Coupe for evaluation. DMC also says they're excited about the prospect of "putting several hundred people back to work" in Wilmington, though it's unclear at how much capital it would take to acquire the plant and the source of funding for such an endeavor. Until we get more information we're just going to sit back and enjoy the prospect of GM's Kappa platform getting a second life.